That may sound ironic, but there’s less irony involved than survival instinct: in the Vietnam era, students were also fighting for their own lives—against what seemed to be an unjustified war itself, but specifically against the military draft that spelled death for so many. 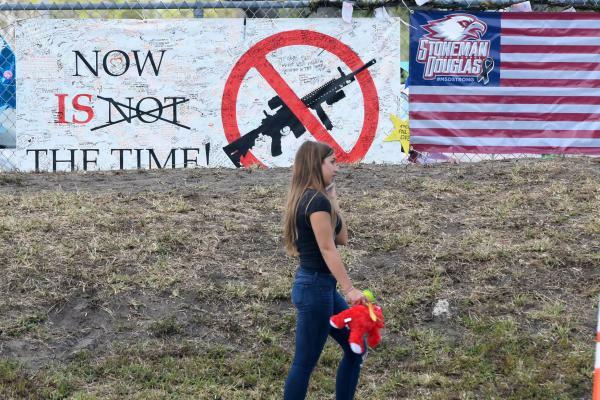 Fast forward to 2018, and students are demanding an end to the dangers they face every day of their school lives because easily-accessed military-style assault weapons have turned their classrooms into potential killing fields. If we’re looking for irony, it’s in the fact that—because of those 1960s-70s student protests—we now have a volunteer military; those who take on that risky life now choose that life. Back at home, our students don’t get to choose their vulnerabilities. And, IMHO, if the best the NRA and our pro-NRA legislators can offer our students is an obligatory lifetime of school days in an armed camp, the burden for gun profits is being placed on the wrong individuals. I write this today for two reasons: 1) because the astrological chart for yesterday’s walkouts reflects that situation on the ground so powerfully, and is worth a look, and 2) because the chart tells us something about the prospects for what is shaping up to be a new Pluto in Sagittarius “movement.” Any time a generation rises up en masse over an issue, there’s an interesting astrological story to tell. Chart #1: Student Walkouts, March 14, 2018, 10:00 a.m. DST, Parkland, Florida. Tropical Equal Houses, True Node. Before we look at significant aspects, let’s consider a few general highlights of this chart. First, set for Parkland, Florida, nearly everything is placed above the horizon, reflecting the solidly collective scope of yesterday’s actions. The possibilities for a sustainable movement are supported by the fixed Taurus ascendant, disposed by a feisty Aries Venus. Venus may rule this chart, but she is backed up by a staunch, demanding Capricorn Saturn, one of two final dispositors of this chart. Saturn’s support is best gained through effort, which reflects the Venus-Saturn square we see here—more on this below. In home sign Pisces, Neptune is the other chart dispositor, and its energies were well-represented in the euphoria and emotional outpouring we saw yesterday as kids poured out of their schools into streets across the nation. Neptune also reflected the way in which these courageous kids uplifted us all in only a few minutes time. They articulated their messages very well, demanding action, not words, paid their heartfelt respects to fallen students, and showed incredible solidarity. Of course, we can always count on Neptune for some media spin and delusionary rhetoric as well—there was plenty to go around. 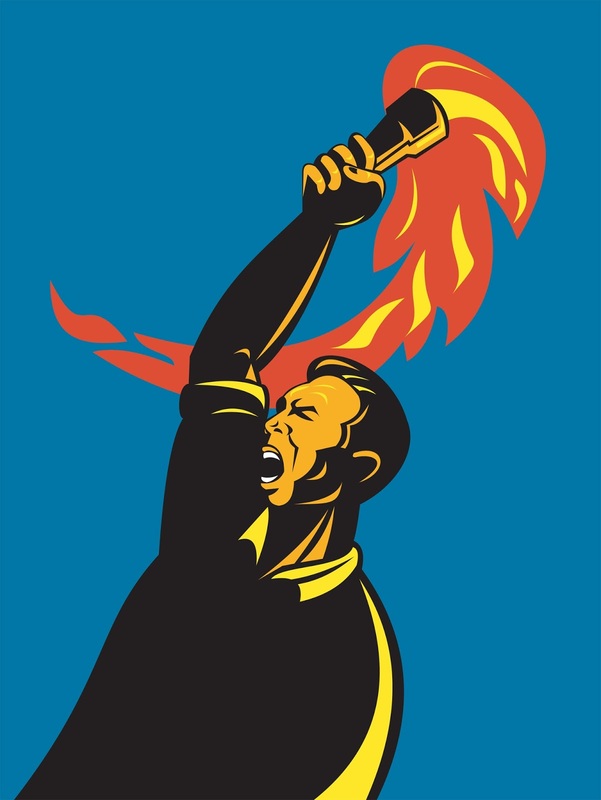 It takes fire to spark a movement and this chart provides plenty, of both the cardinal and mutable variety: Venus, Mercury and Uranus fall in Aries and Vesta-Mars fall in Sagittarius. And, in what may be a surprisingly important placement, dwarf planet Ceres falls in fixed Leo—occupying that 3rd house of education. Ceres and the Leo No. Node (another key player we’ll discuss further) are the only points that fall in the lower, more “personal” hemisphere. These kids are working for themselves, of course, but they also see themselves engaged in an important collective quest. The tendency to see things through a collective filter is built into this young generation’s astrological “DNA,” so-to-speak: born under Pluto in Sagittarius (1995-2008), these kids are coming of age with Pluto in Capricorn. Disposed respectively by Jupiter (Sag) and Saturn (Cap), both these signs promote a collective focus. This explains a lot, but the determination and focus of these teens really becomes evident when we consider their Pluto in Sagittarius ingress chart—a story for another day, soon. Add to all this the fact that Neptune has been in Pisces for many of their formative years, and we can see why compassion might be a powerful motivating force for this generation, as well. Sun (Pisces) trines Jupiter (Rx, Scorpio), sextiles Pluto (Capricorn), squares Vesta-Mars (Sagittarius). These aspects all contribute to the powerful feel of this chart, with its fixed angles and well-balanced distribution of elements and modalities. Mars and Jupiter form a mutual reception, which reflects a powerful opportunity for the students to achieve their objectives, but the house placements suggest another possibility as well: 7th house Jupiter in Pluto-disposed Scorpio could represent the mega-corporate gun industry/NRA (the Other against which the teens are working), and its stake in the matter. It’s key here that Jupiter also sextiles Pluto, providing an opening to grow profits. Naturally, 8th house Mars and Vesta also represent the aggrieved anger and outrage in American households that is helping to fuel this student movement. 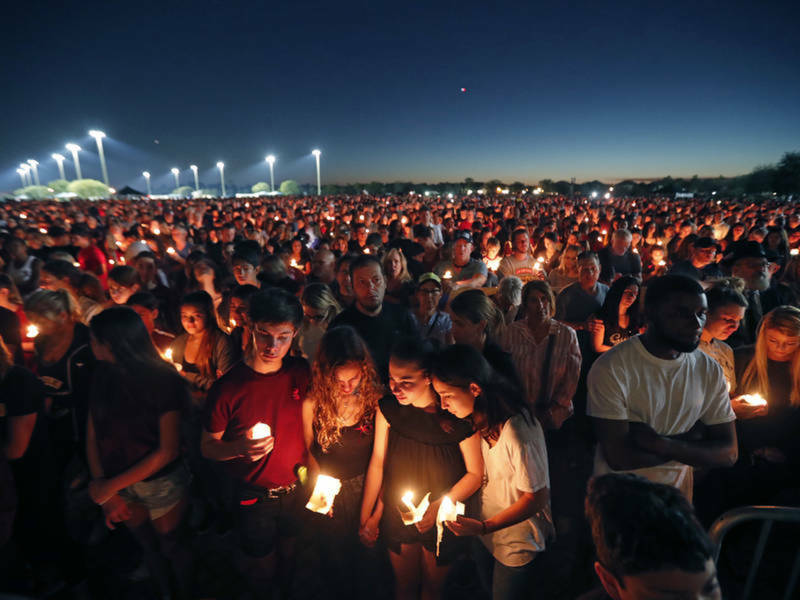 The families of these students seem to be as passionately involved as their teenagers are, thankfully—the kids will need that loving support. 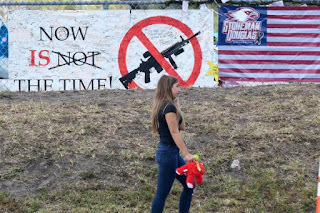 Some caution is warranted, however: the NRA has a virtual army of supporters dispersed across the nation, and with an important mid-term election looming, we can expect a backlash, attempts to vilify the teens and their cause, intimidation tactics and political fireworks. This backlash is especially predictable with Mars also trine Uranus (Aries); thankfully, both these planets will be moving on into earth signs soon (Capricorn and Taurus, respectively), where they can get serious about practical movement building. Moon (Aquarius) squares Jupiter (Rx, Scorpio). The Moon widely squares the ASC-DSC horizon, as well, but the square to Jupiter is probably key here. If, as we saw above, Jupiter represents the “powers-that-be” that will throw their considerable weight behind maintaining gun rights as they are (fixed energy), this square accurately reflects the lines of conflict: young people looking for change vs. powerful lobby working to maintain the status quo. Venus-Mercury-Part-of-Fortune (Aries) square Saturn (Capricorn) and trine Ceres and No. Node (separate trines, Leo). We discussed earlier how significant these cardinal square aspects are, especially between chart ruler Venus and chart dispositor, Saturn. The teens are challenging authorities (Saturn) to make proactive institutional changes and importantly, to demonstrate with those changes that the lives and safety of American children are valued over gun profits. 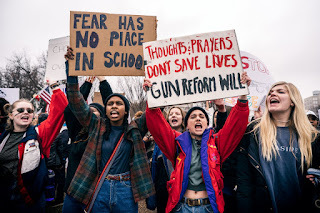 The Mercury-Saturn square pushes these kids to express their messages in starkly clear terms: it’s us or gun profits…choose! This clarity and focus is a powerful arrow in their “quiver,” and one they’ll want to protect. The message will both promote their movement and with Mercury trine Ceres and the No. Node, it should also give them an outlet for healing. Ceres is thought to promote healing environments, and with Ceres and No. Node hovering near each other in the personal sector of the chart, these teens should find some kind of catharsis in their protest efforts. With Ceres in the 3rd house of schools, it appears these students will find a strong support system in each other and in their school communities: they are both creating and benefitting from the solidarity (Leo). Neptune (Pisces) inconjoins No. Node, sextiles ASC (Taurus) and trines DSC (Scorpio). These aspects may not look very significant, yet public sentiment will either be swayed to support the teens’ drive to make practical, life-affirming adjustments to gun laws (Taurus), or it will be swayed by the NRA’s fear-mongering narrative, that gun owners will lose their 2nd Amendments rights, that the “government is out to get their guns” and worse. Neptune can be channeled in two major directions: towards compassionate solutions to the dilemma at hand, or into delusional conspiracy theories and extremism. 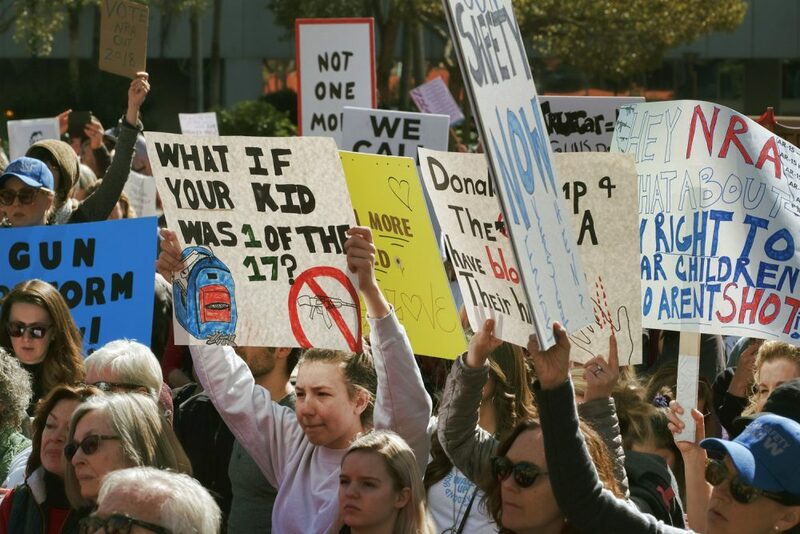 The teens are clearly aiming for the compassionate choice, but they should brace themselves for an extremist backlash, as well. Attempts to sow chaos in their midst and to weaken their resolve may also be a factor. Here’s where emotionally mature adult supervision will be helpful. Neptune’s mutable energies are also embodied in the exact Mars-Chiron square (Sagittarius-Pisces) that spans the 8th-11th houses, and they may, over time, create a sluggish inertia that undermines the movement. Depression is a real possibility in many: these kids have lost loved ones and as charged up as they may be right now about their cause, the reality of these losses could weigh on them, and on their movement. For this effort to be sustainable, it will be important that the individual participants avoid burn-out as much as possible. Unfortunately, this brings us to Neptune’s most frustrating “super-power:” passive resistance, saying “yes, we care,” and then doing nothing about it. Or, politicians finely mincing their words and actions and stalling progress. Or dragging things out so that the kids will simply lose patience and give up. The Mars-Chiron square suggests that not making progress will rip open the wounds these students have suffered; with this we run the risk of producing a lot of angry young people, and where will that get us? It’s also significant that Saturn and Neptune form no aspects in this chart: as difficult as the interactions of these two energies can be, it’s almost worse when there’s no aspect at all! As mentioned earlier, because the planets both transits their home signs here, they share the role of final dispositors in this chart. So, we can expect that any movement that emerges from yesterday’s efforts will be somewhat on-again, off-again. 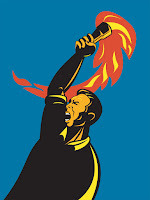 The students and their supporters will at times have no problem channeling their cardinal drive into well-conceived and orchestrated efforts (Saturn in Cap), but there will be other times when a persistent undertow of passive resistance (Neptune in Pisces) seems to overwhelm and mire their enthusiasm. One of the key virtues of this movement thus far is its passionate authenticity—that wonderful quality of awakened youth. They clearly believe that change is possible and I pray they will not be bitterly disillusioned by adults in powerful positions. IMHO, we must help these courageous young people to see that their lives are not merely expendable materiel in this society, but are deeply valued and worth any and every change we need to make. Above all, I hope our leaders don’t impose their jaded political viewpoints on these teens: that would be a profound betrayal. And, it would be profoundly unwise: these Pluto in Sag warriors will be turning their passion and anger into votes, very soon! Raye Robertson is a practicing astrologer, writer and former educator. A graduate of the Faculty of Astrological Studies fundamentals program (U.K.), Raye now focuses on mundane, collective-oriented astrology, with a particular interest in current affairs, culture and media, the astrology of generations, and public concerns such as education and health. Several of her articles on these topics have been featured in The Mountain Astrologer and other publications over the years.